During Ed's 20 year career as a finance/operations executive within the casino resort industry, many of his colleagues and co-workers talked with him about the concerns they had for their own financial well-being. Having excelled in such a complex and heavily regulated financial environment and enjoying these conversations, Ed developed a passion for helping guide people through their important financial mileposts. 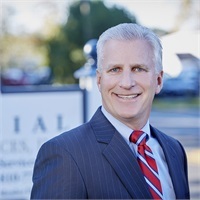 In order to provide people with the skilled steadiness required for sound financial planning, Ed earned his CERTIFIED FINANCIAL PLANNER™ Practitioner designation and joined M Financial in 2011. His focus is on helping business owners, corporate senior managers and other leaders develop strong financial plans so they can be more sure of where they are today and where they are headed in the future. The team at M Financial Planning Services and LPL Financial provide Ed with the necessary resources to help his clients accomplish those goals. Ed is a retired certified public accountant, and holds an MBA in Finance from Drexel University.